DNS, the Domain Name System, is a vital part of the Internet. And since it’s such a vital part of the Internet, it’s important that websites have correct DNS settings. If they don’t, it can lead to a number of problems, one of them being downtime. On top of that, bad DNS settings can be hard to track down and can cause a lot of head ache for webmasters and site owners. We here at Pingdom run a website monitoring service that tracks the uptime of tens of thousands of websites for our users, so we deal with site issues on a daily basis. Over time, it has become exceedingly clear that a large portion of the various errors we detect are caused by bad DNS settings or poorly configured DNS servers. This is why we now are introducing an addition to our free webmaster tools: a DNS health test. This new test takes a domain name – that of your website, presumably, but you can test any domain name – and figures out which DNS servers it’s set up on, then makes sure that there are no strange settings that can cause problems. It’s a very thorough test, so it should root out any issues that can cause you problems either now or down the line. Those of you who like to know exactly what tests are being done can find the details under the “Advanced View” tab. If you get warnings or errors from the test, make sure to bring this to the attention of the person or company that administrates your DNS servers and settings (if it’s not you). For this purpose, we automatically create a permalink to your test that you can copy and paste into an email or other message. It shows up as soon as the test has finished. If you’re feeling social, you can also share the results directly to Twitter or Facebook. In some cases, warnings in this test will be things you can live with, but it’s best to be sure. 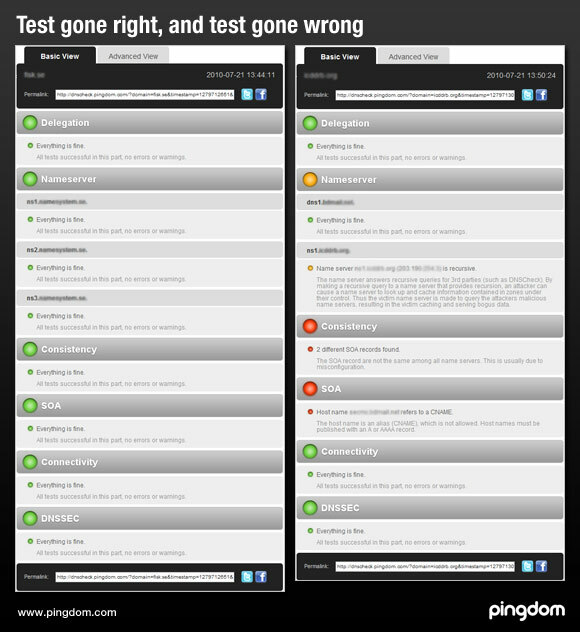 Ideally, your test should be all green and that is what you should strive for. The DNS Health test is our latest addition to Pingdom Tools, which also includes Ping and Traceroute tools, and the popular Full Page Test that helps you track down bottlenecks with your website’s performance. Pingdom Tools is a long-term project for us, and we want it to be a useful and free resource to you, the webmasters, sysadmins and site owners of the Internet. We hope you will find it useful. We would also like to give a big shout out to the DNS gurus over at .SE, whose work this latest addition is based on. And now, what are you waiting for? Go test your DNS settings! Nice tool, it’s very handy and useful for any webmaster. @andrei009: Thanks, we’ll have to look at that. Excellent idea. I’ve used various implementations of these over the years. Host did not accept hostmaster@example.com as SMTP recipient. The mail server did no accept mail to the recipient address. This is probably due to an unknown address. @Jay: You should be able to see that in the advanced view (the other tab). Really nice tool, also like the ‘Full Page Test’! But for the DNSSEC test it maby would be better to say that it is not activated if the domain does not have any DS records insted of saying ‘Everything is fine.’? And a check box for ‘Save test’ like the other tests have would be appreciated.